The Chang'e-4 space probe would be the first ever to make the trip. After decades of playing catch-up with the U.S. and Russian space programs, China is poised to do something neither nation nor any other has ever done: land a spacecraft on the dark side of the moon. Strictly speaking, of course, the moon has no dark side. But because of the way it orbits Earth, our natural satellite shows us only one side — the other is perpetually hidden from our view. No one even saw the far side until 1959, when the Soviet Luna 3 spacecraft flew around for a look and sent back photos. Even now, the logistics of reaching the far side are so daunting that no astronaut or probe has ever gone there. That long stretch of solitude is set to end later this year. In December, the China National Space Agency (CNSA) will launch a chin-high, 2,500-pound lander called Chang’e-4 to the South Pole-Aitken Basin, at the southern end of the lunar far side. (Chang’e is the goddess of the moon in Chinese mythology, and the name of all of China’s moon landers.) A couple of weeks later, Chang’e-4 will settle on the surface and deploy a small rover, as yet unnamed, to survey the terrain there for the first time ever. “The new Chang’e mission will be a significant milestone simply because the far side has never been visited,” said Paul Spudis, a veteran lunar researcher based in Houston. Spudis and other planetary scientists have long been captivated by the lunar far side because its terrain is thought to be quite distinct from that of the side we see. By directly examining the geology of its landing area, Chang’e-4 could solve longstanding mysteries about the moon — including how it formed 4.5 billion years ago in the wake of a collision between Earth and another celestial body. “The mission will enable us to discover what we haven't known about the moon,” Pei Zhaoyu, deputy director of CNSA’s Lunar Exploration and Space Program Center, said at an April 24 event in Harbin, China, marking China Space Day. There’s also a strategic reason to target a landing site near the lunar poles: Shadowed craters at high latitudes on the moon may hold significant deposits of frozen water. NASA and a number of private companies, including a startup in Cape Canaveral, Florida called Moon Express, have been exploring the idea of mining that ice to make rocket fuel or to obtain water and oxygen for a future lunar outpost. Chang’e-4 is not a water prospector, but it represents an important technological step in that direction. One of the greatest challenges facing the Chang’e-4 mission is communication. The lunar far side is in a constant state of radio blackout because radio transmissions can't penetrate the moon, which has a diameter of 2,160 miles. 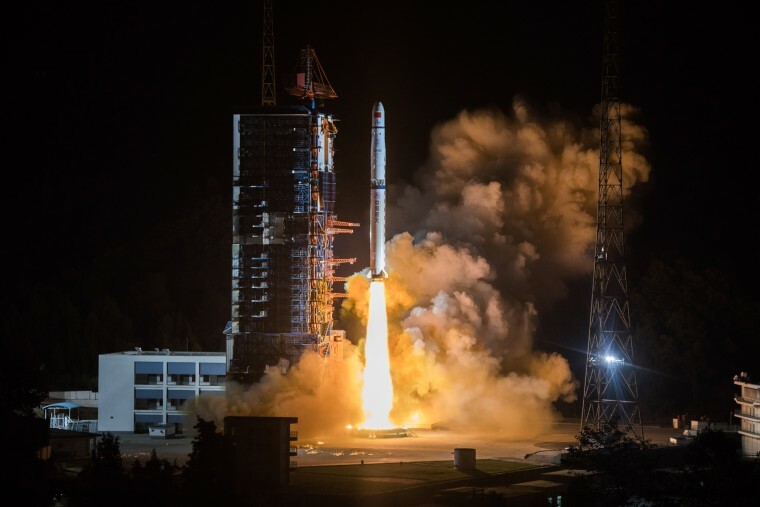 To get around that problem, CNSA launched a relay satellite called Queqiao (“Magpie Bridge”) on May 20. It will bounce messages back and forth from its vantage beyond the moon. Queqiao is now in a stable orbital zone called L2, waiting for Chang’e-4 to arrive. In the meantime it’s doubling as a space telescope, using a 15-foot antenna to listen for emissions from the distant universe from its exceptionally radio-quiet location. Once Chang’e-4 lands, Queqiao will begin relaying data between the lander and its controllers in China, creating the first-ever radio link to the lunar far side. The lander is designed to focus on taking detailed photographs of its surroundings, while the rover will sample the chemistry of rocks and peer into the lunar crust using ground-penetrating radar. Chang’e-4 will also carry a miniature “lunar biosphere” containing silkworm eggs and a tiny greenhouse designed to germinate potatoes and Arabidopsis, a plant related to mustard. It seems like a lark, but Liu Hanlong, director of the experiment and vice president of Chongqing University, said the biosphere is serious science. “We want to study the respiration of the seeds and the photosynthesis on the moon,” he told the Chinese Xinhua news service. Targeting the lunar far side is just the latest step in China’s ambitious moon program, which began with Chang’e-1 in 2007 and Chang’e-2 in 2010, followed by the Chang’e-3 probe, whose 2013 landing on the moon was the first since 1976. Chang’e-4 uses the same basic hardware as its immediate predecessor. If Chang’e-4 succeeds, China plans to launch Chang’e-5 in 2019. Its mission will be to gather moon rocks using an orbiter, a lander/collector, an ascent stage, and a capsule that will separate from the orbiter and return the rocks to Earth. “With these missions, the Chinese will have demonstrated complete mastery of flight in cislunar space,” Spudis said, using the scientific term for the strategically important region between Earth and the moon. CNSA is already outlining ideas for Chinese astronauts to follow the robots to the moon. Last year Zhaoyu told an international astronautics conference that China plans a permanent robotic lunar outpost in about 10 years — and hinted at a human presence on the moon another decade or so after that.